While my sister and brother-in-law were in town, we had sunset drinks at Red Sky, the rooftop bar and restaurant at Centara Grand hotel at CentralWorld. In the past few years, the number of rooftop dining and drinking facilities has exploded from just a pair – the Banyan Tree hotel and Scirocco – to dozens. Looking north, you see the Baiyoke 2 tower, the tallest building between Hong Kong and Kuala Lumpur; the Amari Watergate hotel, the new Novotel Bangkok Platinum hotel, and the golden domes at Platinum Shopping Center, all of which are located in the Pratunam (“water gate”) district. 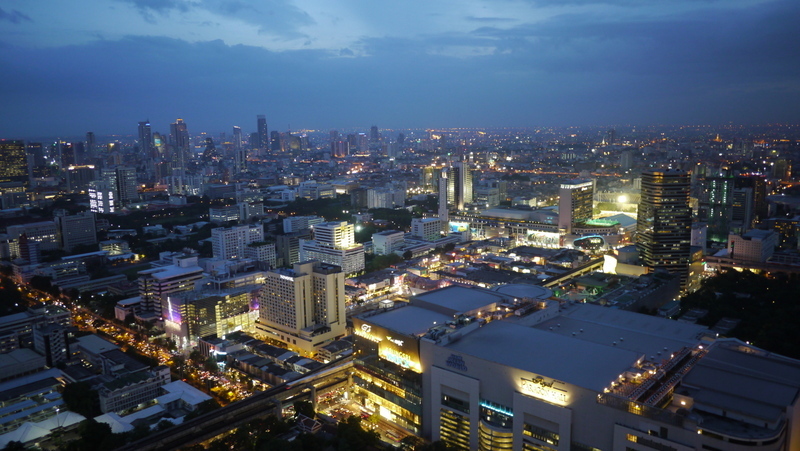 Looking southwest, you can see the Siam Paragon shopping center in the lower right, Siam Square in the center, and the Silom/Sathorn busines district in the distance. The golden chedi of Wat Saket (“Golden Mount”) is on the far right side of the horizon. Looking southeast, you see the rest of CentralWorld, the Ratchaprasong intersection (the one closed for 40 days by red shirt protesters two years ago), the Intercontinental and Hyatt Erawan hotels, the Gaysorn shopping center, and, in the distance, the high-rise districts of Ratchadamri in the center and Witthayu (Wireless) Road to the left. 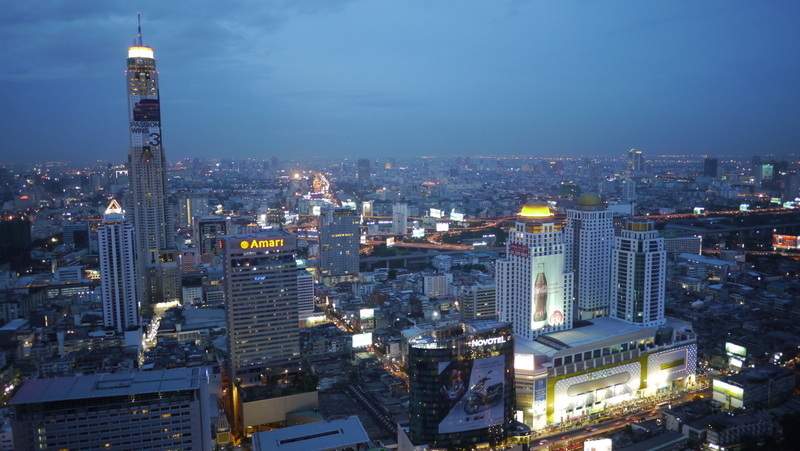 This entry was posted in Uncategorized and tagged Bangkok, CentaraGrand, Skyline, sunset, View by christao408. Bookmark the permalink. Amazing shots and what an adventure living there must be. I thought the State Tower was the tallest building in BKK? Nice, I can see some familiar sights….the Baiyoke high rise, Grand Hyatt Earwan, Gaysorn Mall, skybridges etc…..want to fly over right now! @LostSock21 – According to Skyscraperpage.com and the related Wikipedia entry, the tallest is Baiyoke II followed by Tower A of The River condos, and State Tower is a distant third. Also according to those sources, the Centara Grand hotel (where these pictures where taken) is the fourth tallest. Didn’t know that! @CurryPuffy – You are welcome anytime. @Grannys_Place – @bonmots – It is a city that definitely looks better as the sun goes down. I love shots of the city at night taken from above. Beautiful thanks. Would love to eat there! we had christmas eve dinner at centara and red sky! the buffet is to die for, foie gras and unlimited wine! Nice city at night pictures. A lot of little lights in the darkness is much easier on the eye that one big ball of brilliant fire in the sky during the day! And I saw your clever product placement! Have a Coke and a smile! Rooftop bars are one of these crazes. A few years ago every city with access to water turned their old piers into wine, shop, and dine places. It kind of shows that people do long that sea of tranquility amidst the bustling metropolis. It’s not easy for us back here to realize Bangkok is a world class city. @Douglas_Drive – Correct and corrected. I didn’t proof before posting. @Inciteful – Sure enough, with somewhere between 8 and 10 million residents, it is comparable to New York. @beowulf222 – One thing that is nice is, once you are several dozen floors above the city, the weather is much more pleasant. @whyzat – It would have been clever product placement if I had cleverly placed the product there. In this case, it was just a billboard that happened to be there. Sadly, Coke won’t be writing me any checks. =(@girl_smileyy – I’ve heard they are doing a Sunday brunch buffet once a month now, that is supposed to be very good. @ItsWhatEyeKnow – Put it on the to-visit list! @agmhkg – Is it? I know that lots of places write about Scirocco at the State Tower, but Centara Grand is much better in my opinion. @Fatcat723 – Glad you enjoyed it! Love the photos – so many places that I recognise and makes me wish that I was there. Mmm, BKK certainly is beautiful. great shots. never knew bangkok can look so metropolitan. but it does look as packed as i thought the city would be. @venice – Bangkok will always welcome you back… unless the airport is closed by protests. LOL@rudyhou – It is a very big city, comparable in population to New York. Frankly, I think it looks a lot better after dark. @secade – It can be. We’ll show it to you when you come visit. Stunning photos! Just out of curiosity, are all the skyscrapers hotels and business buildings, or are there residential tall buildings as well in BKK? @blueflowe – Lots of high rise residential. In the picture, there’s a building about 2/5ths of the way from the right side that has a triangular, well-lit top. 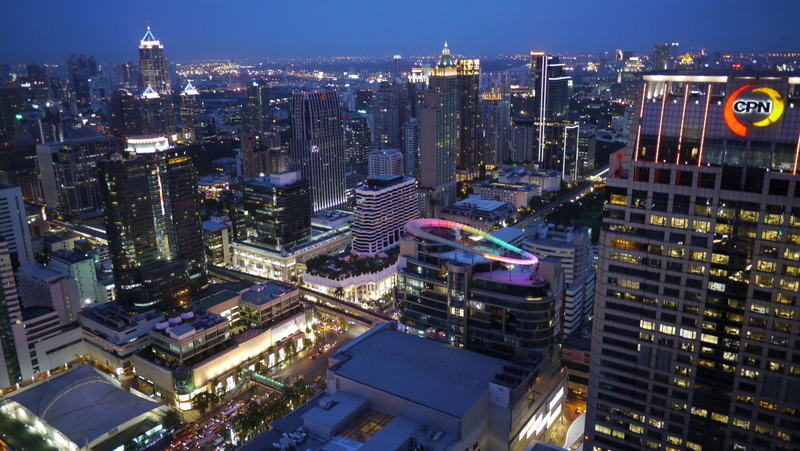 That building and those immediately surrounding are very high-end condos near Ratchadamri station.